Playing real money poker on the iPad is a pretty new phenomenon. But as the number of poker players with iPads - both the standard version and the iPad Mini variety - continues to grow at an incredible clip, so does the number of choices players have for iPad poker. Receive up to $5000 Free with first deposit! Drake Casino is a mobile compatible casino that accepts USA players. Receive up to $1000 Free with first deposit! Slotland Casino is a mobile compatible casino with slots, blackjack, video poker. All told, the typical iPad online poker experience is a bit closer to the mobile experience than the desktop experience in terms of features. In general, it's a completely pleasant way to play online poker, but those who also play using their desktop should prepare for a bit of a departure from what they're used to. A few key differences between playing poker on your iPad and playing online poker on your Mac or PC include the lack of support for multiple tables (or a lower number of total tables permitted), the absence of support for third-party tools like Hold'em Manager and PokerTracker, a stripped-down table experience that may omit notes and statistics, the inability to request withdrawals or make deposits and a lack of secondary options like hand histories or responsible gambling tools. While the number of real money poker apps for the iPad may be relatively minor, there is no shortage of apps that will let you take part in play-money games. These play-money poker apps for the iPad can be divided into two basic categories: Pure free-play apps and quasi free-play apps. Pure free-play apps: These poker apps for your iPad allow you to take part in poker games using free chips. And they never charge you for additional chips, nor do they even offer the option to purchase additional free play chips. Instead, your free play account can simply be reloaded as often as you like (although reloads may be limited by some time-based restrictions depending on the app). Quasi free-play apps: These apps let you play poker games for free on your iPad, but you also have the option to purchase additional chips. While you can buy more chips on these iPad poker apps, you can never cash out - the chips are for entertainment only. Both types of apps let you play for free, and both are great ways to get accustomed to playing poker on your iPad. As many players will tell you, playing poker on the iPad is much different than playing on a desktop, or even than playing poker on a mobile device. It's a unique experience unto itself, and there's nothing wrong with familiarizing yourself with that experience using free-play iPad poker apps. Browser-based online poker - The latest browser-based online poker clients are being developed with tablets in mind. While iPad owners are somewhat limited in their browser-based online poker choices due to the fact that the iPad doesn't support Flash or Java (two very common platforms for browser-based clients), new technologies like HTML5 are providing an increasing number of poker choices compatible with the standard iPad web browser. Jailbreaking - We don't endorse jailbreaking your iPad, as it may cause complications or violate your carrier agreement. But the reality is tens of thousands of iPad owners have done so. And jailbreaking does allow you access to additional apps and browser-based online poker options for your iPad than you would otherwise have available. Remote PC access - Plenty of off-the-shelf programs allow you to easily connect to a desktop using your iPad, letting you basically run anything that can be run on your desktop on your iPad - including online poker software. Apps allowing this setup - such as GoToMyPC - generally cost only a few bucks, are completely secure, and allow you to make your poker game truly mobile. We should note that advanced features like HUDs or an excessive amount of simultaneous tables can seriously degrade the performance of remote access software, so you should plan on playing only a table or two at a time with this setup. 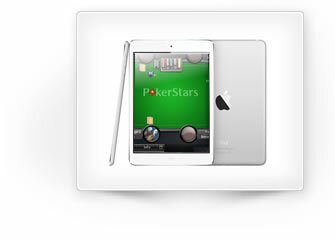 US poker players: What iPad options are available? US poker players simply don't have much to choose from when it comes to native real-money poker apps for the iPad. You won't find any such apps in the App Store, and it's unlikely that any real-money poker apps for the iPad will appear any time in the near future. While poker players are somewhat out of luck when it comes to iPad-compatible poker apps, casino players from the USA fare a bit better. Online casinos are far ahead of their online poker counterparts when it comes to developing mobile-friendly poker software, and the result is that American casino players can take their pick from a number of casino games compatible with the iPad - both free play and real-money games.